Chalet wood Vosges comfortable for 2 to 8 people in a mountain setting, surrounded by pine trees, main shops (bread, newspapers, tobacco, hairdresser, ski rental ... in the village located 400 m.
For lovers of fishing and idleness, a pond 300 m or fishing in the river with a compulsory card. Superb views from the balcony and the wooden terrace, on the ski slopes of the station FRÈRE JOSEPH located 4 km with its Chapel listed historical monument, on the valley, the sunsets and the mountainous landscape. - Spacious living room 34 m2 with comfortable living room, flat screen TV, free WIFI, hearth fireplace with wood OFFERED. - Fully equipped American kitchen giving access to the covered terrace with barbecue, garden table and chairs, parasol. large fridge, oven, microwave, small freezer, raclette, fondue, .. 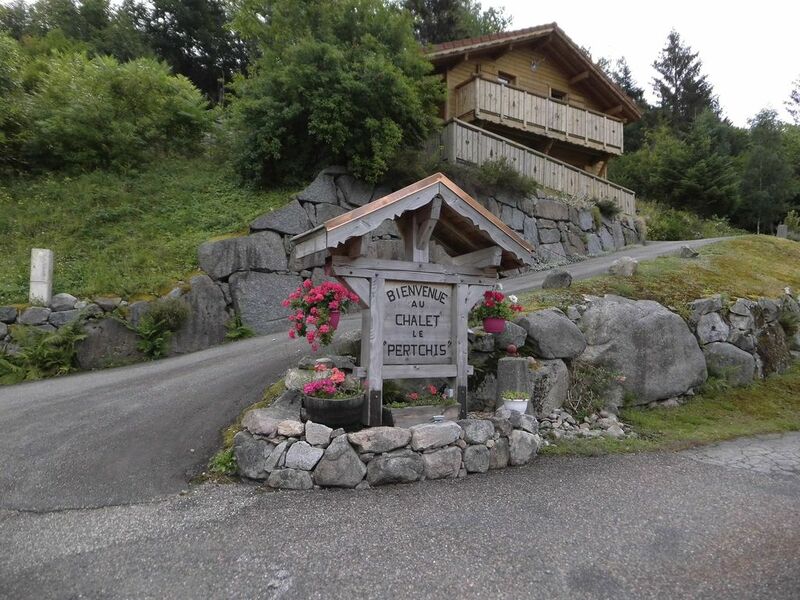 There are 2 bedrooms, double bed 140 x 190 with balcony, view of the valley, the ski slopes and the sunset, bedding very good condition. Outdoor room for skis or bicycles with washing machine 5 kg and storage WOOD. Nous avons passé une excellente semaine dans ce chalet très beau, très bien entretenu et vraiment tout équipé. Tout y est pour s'y sentir comme chez soi et la région est très sympa à visiter. Nous avons fait pas mal de ballade et du ski et de la luge à Ventron et à La Bresse, juste génial pour les familles. Nous recommandons vivement et espérons y revenir au plus vite ! Séjour très agréable. Magnifique région qui mérite d'être découverte! Le chalet est très agréable : spacieux, cosy et très fonctionnel. Nous y avons passé un merveilleux séjour. Merci encore à son propriétaire très disponible et sympathique ! Séjour que nous reproduirons sans aucun doute! We hebben genoten van het magnifieke uitzicht, maar ook zeker van het comfortabele huis. Met drie terrassen was de keus voor zon en schaduw wel heel gemakkelijk. Pascal en Nathalie hebben echt aan alles gedacht. Er is met veel liefde en aandacht voor elk detail het chalet ingericht. Er was een schommelbank, ligstoelen en zelfs hout voor de kachel. Op de avond van 14 juli werden we recht voor ons chalet getrakteerd op een schitterend vuurwerk. We hebben paragliders van heel dichtbij hun landing zien inzetten in het dal voor ons. Wat een prachtige omgeving met heel veel natuurpracht en een hele aangename stilte. Dit chalet is een ware aanrader! Great place with lots of things todo. The chalet is very well equipped. The owner is very friendly and helpful. There is lot's of stuff to do in that part of the Vosges. Great places to eat and great walks you can make.